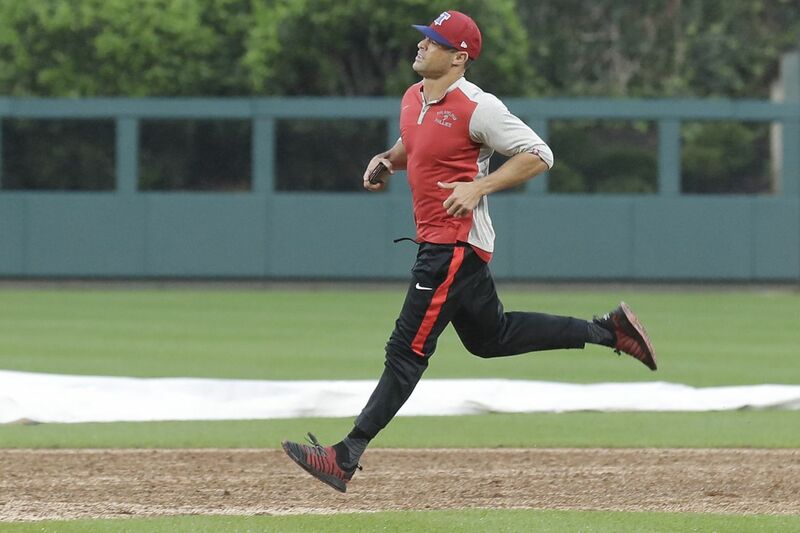 Phillies manager Gabe Kapler runs the infield after grounds crew members worked to dry the field Monday night. At about 6:25 p.m. Monday night, less than an hour before the first pitch was supposed to have been thrown, Washington Nationals leadoff hitter Adam Eaton went for a walk on the infield at Citizens Bank Park. "It felt like pudding," he said. Across the field, between first and second base, Nationals ace Max Scherzer made like he was going to run. And the first word that came to his mind to describe the playing surface beneath him was "spongy." For hours, the Phillies' grounds crew had been taking the unusual measure of using blowtorches to dry a field that was left uncovered Friday night when the forecast called for considerably less rain than what actually fell. Steady rain on Saturday and Sunday didn't allow for the opportunity to treat the field and left a soaked, muddy mess by Monday afternoon. And although Howard Smith, the Phillies vice president of business affairs, said he was confident the teams would get the game in, players on both sides knew better. "The dirt was spongy. It would literally give out," said Scherzer, the Nationals' representative to the players' union, who shared his opinion with Phillies rep Rhys Hoskins and umpire crew chief Hunter Wendlestedt. "That was just us acting like we were going to run. The moment we would put any weight in the ball of your foot, the dirt would just give out. "There were parts of the infield they said they could get it better, and we tested those areas, [he and Hoskins] looked at each other and just thought, this is going to get torn up when guys are going 100 percent. And you can't have any one [soft] spot out there because that's how you get injured." The whole situation was surely an annoyance for both teams. At one point, Nationals star Bryce Harper stepped onto the field, grabbed a rake and pretended to help the grounds crew. Washington Nationals rightfielder Bryce Harper picks up a rake while the two teams discuss the infield’s conditions. But rather than casting blame on either the Phillies or the grounds crew for not anticipating heavier than expected rainfall, Nationals players and officials endorsed the decision by Major League Baseball to postpone the game in order to ensure the players' safety. According to Retrosheet.org, it marked the first postponement because of unplayable field conditions since a Yankees-Brewers game on Sept. 21, 1987, at County Stadium in Milwaukee. "We all got together and for the safety of the players we agreed that the field was not playable," Nationals manager Dave Martinez said. "It was a good decision. The field was very soft. I didn't want to put our players out there, and I don't think [Phillies manager Gabe] Kapler did either. And the umpires agreed." Martinez has witnessed unplayable conditions at Citizens Bank Park before. He was the Tampa Bay Rays' bench coach in 2008 when Game 5 of the World Series was suspended in the fifth inning because of unrelenting rain and resumed two days later. But the sight of blowtorches on the field conjured Martinez' memories of his minor-league days, when he recalled helicopters being brought in to dry rain-drenched fields. The problem, according to several players, was that the blowtorches dried only the top layer of dirt but left the dirt wet beneath it. "We gave [the grounds crew] some extra time to see what they could do," Martinez said. "I could see two or three innings trying to play and that field just becoming a big, big, bigger mess." The grounds crew continued to work throughout the night after the game was postponed. But with more rain in the forecast Tuesday, Eaton was skeptical that the field would be ready to go for a doubleheader that is scheduled to begin at 3:05 p.m.
"With the moisture in the air the way it is, you're going to want a sunny day for that to dry out," Eaton said. "But it's why we're professionals."